Although you can credit the Marvel Universe with the creation of Fantastic Four #1 in 1961, the latest Fantastic Four movie doesn’t seem to be faring very well at the box office and surprisingly (well, maybe not surprising because they sold the rights for the FF to Fox and Marvel didn’t want to promote it for free), Marvel Comics recently cancelled this series which used to be their flagship first title. 1) These issues by writer Stan Lee and artist Jack Kirby are among the elite few, long run of comics in which the writer-artist creative team have continuously worked on over 100 consecutive issues without a fill in issue! 106 issues in fact, impressive by any standard. Today, creative teams barely last a whole story arc of 6 issues, kudos to Kirby… and Lee. 2) So many new characters, concepts, locations and ideas from the Marvel Universe are introduced in these comics. Every single issue added something to this new shared Marvel Universe. Explosive new characters the likes of Dr. Doom, Annihilus, The Inhumans, Silver Surfer, Galactus, and the Black Panther were all introduced in the pages of Fantastic Four. Kirby and Lee were firing all cylinders when they created these, especially during the 45 through 65 issues. These early issues of the Fantastic Four were the bricks and mortar of the blossoming new Marvel Universe. 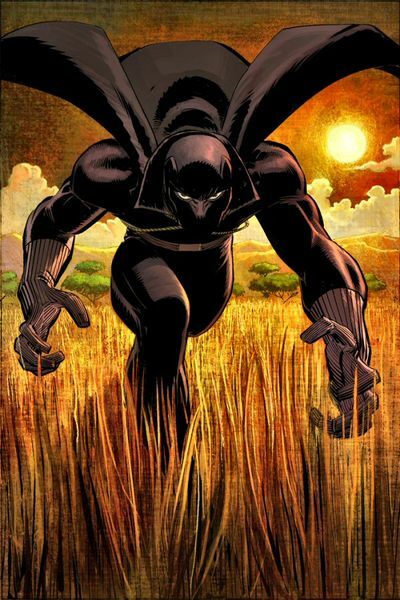 The Black Panther is an extremely rich, intelligent ruler of a fictional African nation called Wakanda. Wakanda happens to be home to the largest source of Vibranium, the world’s strongest metal. Because of this, Wakanda is the most technologically advanced country in the Marvel Universe. 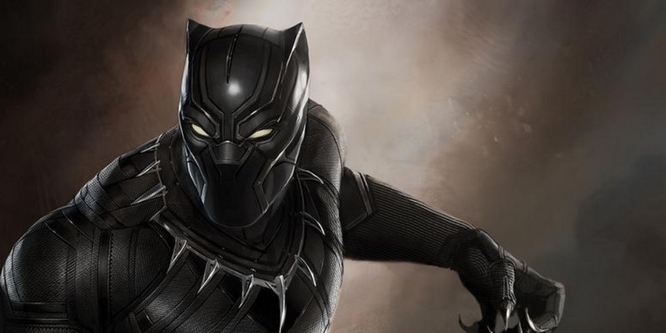 Black Panther’s homeland is showcased in the latest Avengers movie: Age of Ultron. 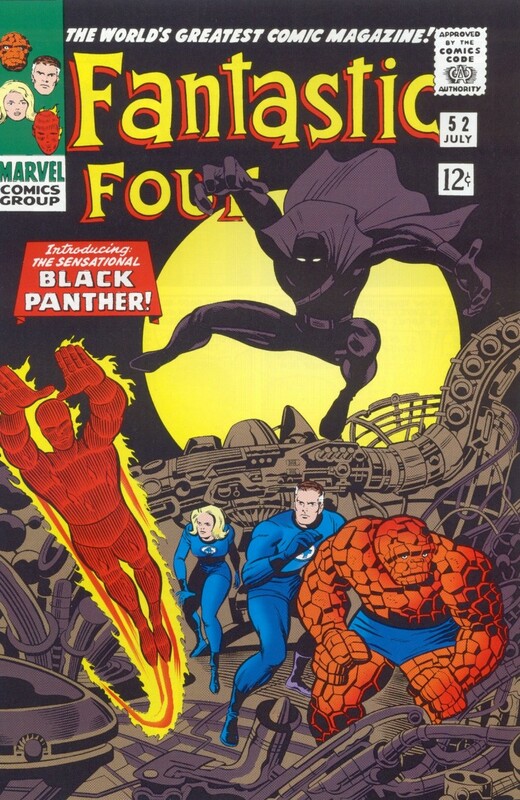 The Black Panther exhibits all the super human abilities of a panther, which allows him to take on each member of the Fantastic Four, and best them! His powers extend beyond his physical abilities, he is known for his inventions and is a scientific genius, among the ranks of Tony Stark/Iron Man and Reed Richards of the Fantastic Four. He later becomes an important ally to the Fantastic Four and he has run in with Captain America who invites him to become a member of the Avengers team. Black Panther will be showing up to make his movie debut in the upcoming Captain America: Civil War movie, played by Chadwick Boseman. This has already begun to spark an interest in this diverse comic character, and will further drive up the demand of his comic. I picked up my #52 this last year, however I first read a reprint of the comic back in the 80’s. I remember how much I liked Panther’s costume… Kirby did such a nice job rendering the character. I have to admit it was difficult to find a reasonable issue #52. I was on the hunt for about 6 months, the rich dark colors on the cover make it especially difficult to find one in decent condition. However because I live for the hunt, like a panther (sorry couldn’t resist), this made finding my copy that much more satisfying. Overstreet Comic Book Price Guide #45 (2015) has the NearMint of this comic at $2,000.00. The value has increased $900.00 (82%) since last year, and an overall increase of $1,905.00 (210%) since 1999. There is no stopping the demand on this book, it is a very important key for Marvel Comics.